With summer just around the corner, Valiant and New York’s renowned Upright Citizens Brigade (UCB) Theatre are teaming up for an exclusive live presentation revealing a massive round of breaking news for the largest independent superhero universe in comics! Valiant is proud to announce its second annual live-streaming media event with #VALIANTSUMMIT 2016 – an exclusive panel presentation broadcasting live from the UCB Theatre East in New York City on Tuesday, May 17th at 2 pm EDT/11 am PDT. 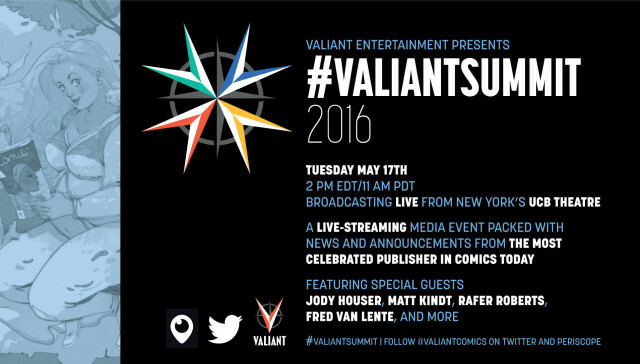 Featuring a slate of major news and announcements for Valiant’s celebrated publishing line and more, #VALIANTSUMMIT 2016 will feature appearances by superstar writers Jody Houser (FAITH), Matt Kindt (4001 A.D., DIVINITY II), Rafer Roberts (A&A: THE ADVENTURES OF ARCHER & ARMSTRONG) and Fred Van Lente (4001 A.D.: WAR MOTHER) alongside Valiant CEO & Chief Creative Officer Dinesh Shamdasani, Editor-in-Chief Warren Simons, and Director of Marketing, Communications & Digital Media Hunter Gorinson. For more than a year, readers worldwide have speculated about top-secret, oft-rumored new projects like BRITANNIA, SAVAGE and PSI-LORDS…and what’s coming next for Valiant’s most indelible icons: X-O MANOWAR, BLOODSHOT, HARBINGER, SHADOWMAN, and more. Fans got their first tease on Free Comic Book Day 2016… Now, get ready to find out the answers as an all-star panel of guests pull back the curtain on Valiant’s plans for 2016 and beyond, only at #VALIANTSUMMIT 2016! Follow all of #VALIANTSUMMIT 2016‘s news and announcements as they happen with an exclusive live stream on the Periscope app at @ValiantComics or via Valiant’s roster of broadcast partners, including VariantComics, Comicstorian, ComicsExplained, and ComicPOP. And join the conversation on Twitter at the official @ValiantComics account or follow along with live coverage throughout #VALIANTSUMMIT 2016 from the industry’s leading press outlets! Plus: Look for a series of exclusive post-game recaps of all of #VALIANTSUMMIT 2016‘s events with interviews, analysis, extras, and more from Variant Comics, Comicstorian, and a host of the hottest YouTube personalities in comics today. Established in 1989 by a brain trust of legendary comics creators, including Jim Shooter, Bob Layton and Barry Windsor-Smith, Valiant is one of the most successful comic book publishers in the history of the medium. With more than 81 million comics sold, Valiant’s award-winning comic book library has produced some of the most iconic and beloved superheroes anywhere in pop culture, including X-O Manowar, Bloodshot, Harbinger, Archer & Armstrong, Faith, Ninjak, Eternal Warrior, Shadowman and nearly 2,000 more. As the home of the largest independently owned universe of superhero characters in the industry, Valiant has distinguished itself with an emphasis on first-rate storytelling and creative innovation. In recent years, the company has forged ahead to great commercial and critical success, winning a Diamond Gem Award for Publisher of the Year and numerous industry awards and accolades. Valiant’s titles consistently rate among the best reviewed in comics. In 2015, Valiant became the first comics publisher to be formally invited by Twitter to pioneer the usage of Periscope for the first annual #VALIANTSUMMIT event, hosted live from Twitter’s San Francisco headquarters. Before a live audience of invited guests and a far-reaching legion of fans from around the globe, Valiant used the occasion to unveil several major announcements, including first word that the best-selling BOOK OF DEATH event had officially shattered records to become the most successful comic book event of the decade from an independent publisher. Tune in live to witness the next monumental afternoon of news and announcements from Valiant Entertainment – the most celebrated publisher in comics today – live from New York’s UCB Theatre East on Tuesday, May 17th at 2 pm EDT/11 am PDT for #VALIANTSUMMIT 2016! Watch the proceedings live on the Periscope app or on Twitter…and join in using the #ValiantSummit hashtag! Periscope is a live video streaming app for iOS and Android. Simply download the Periscope app, create a new user log-in or use your Twitter log-in credentials, and visit @ValiantComics to watch the #VALIANTSUMMIT 2016 panel presentation live from New York’s UCB Theatre East.